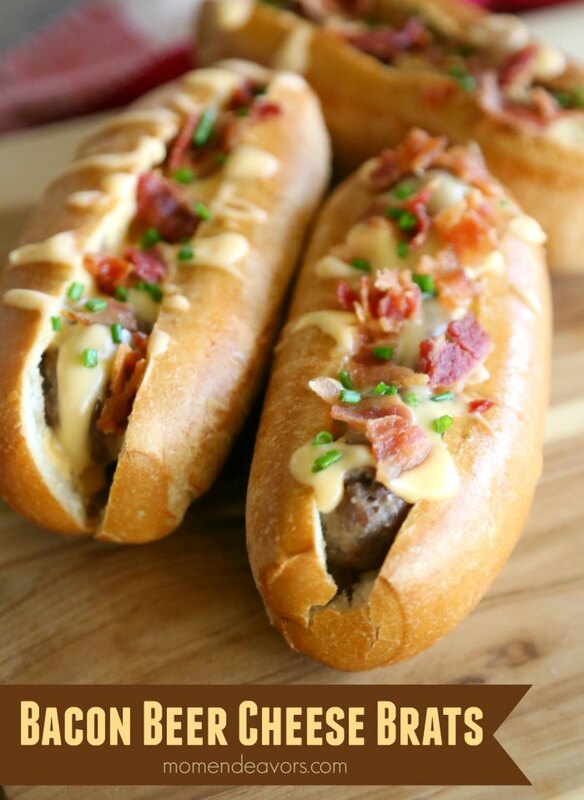 Bacon, beer cheese, and brats?! Talk about some winning party foods! How about all those flavors combined in a delicious meal that takes less than 20 minutes to make?! YES! 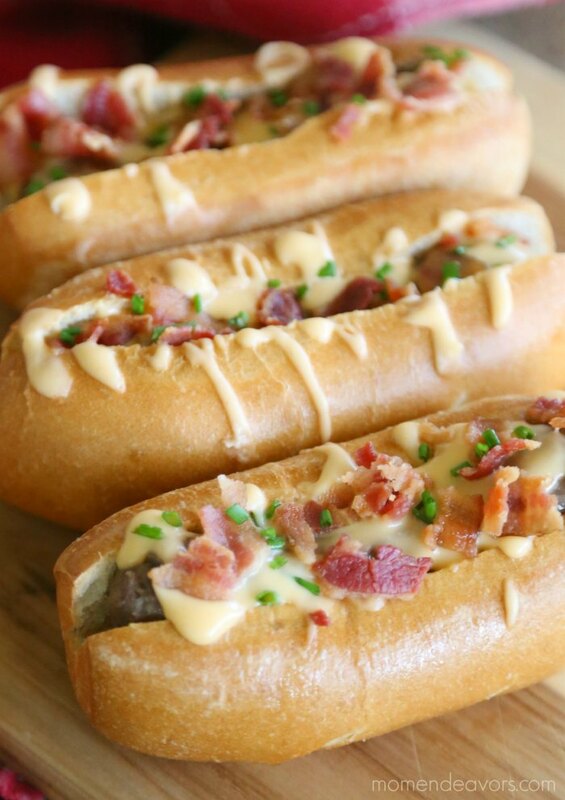 So, I’m thrilled to share this delicious bacon beer cheese brats recipe with you today (along with a great gift idea) as part of a sponsored partnership with Johnsonville. I’m always looking for ways to make meal time easy, yet still delicious! The same is true for parties! You want to save time, without sacrificing on flavor! 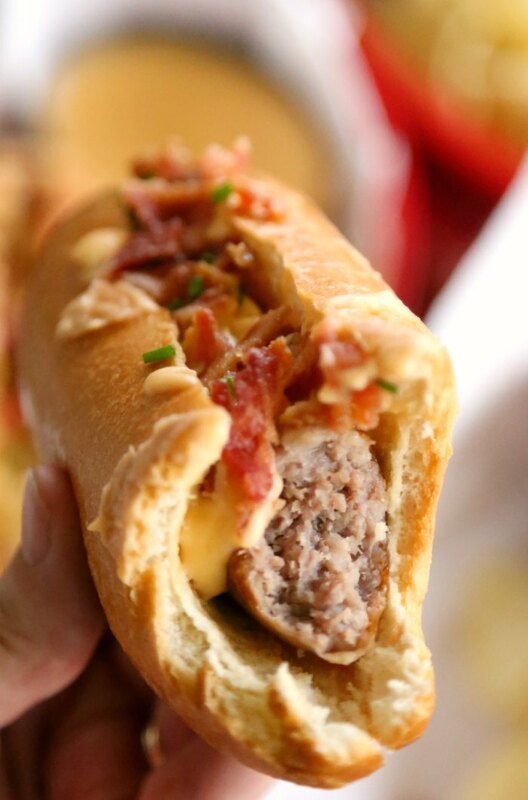 And that’s exactly what you get with these bacon beer cheese brats! On the table in less than 20 minutes, this makes a great weeknight meal (especially during the busy holiday season) or is perfect for a party (think New Year’s Day, football watching, etc). The secret to making these brats so quickly and perfectly is the Johnsonville Sizzling Sausage Grill! Yes! A sausage grill! It made our delicious brats in less than 15 minutes – cooked to perfection! 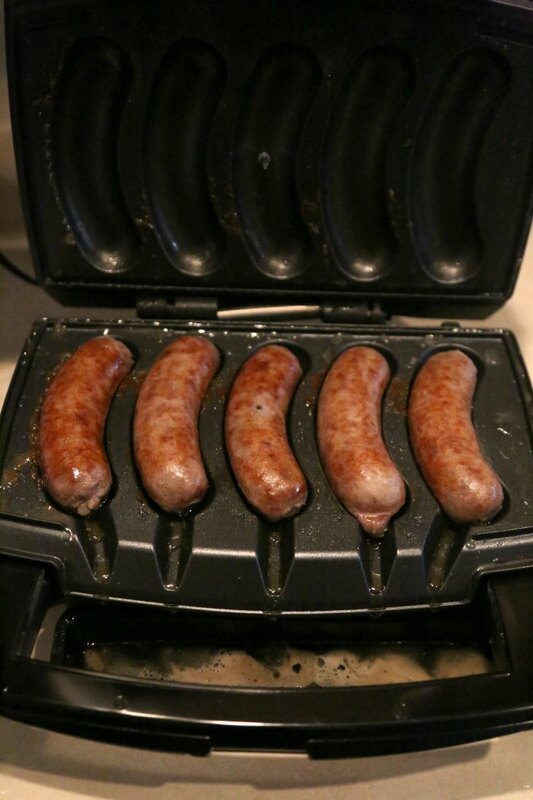 So, the Sizzling Sausage Grill would make the perfect holiday gift for the sausage lover in your life! With this indoor electric grill, you can cook up Johnsonville sausages from the comfort of your own home. How perfect is that when it’s too cold (or too hot) to go outside and grill?! Since the grill ensures perfectly cooked sausage in just 15 minutes, it’s also a perfect party solution so hosts and hostesses can enjoy the party without being stuck in the kitchen (or burning the sausages). I keep thinking about how great this would be for tailgating and football parties at home! With all the college football bowl games coming up, this would make a great gift for the football tailgating fan in your life too! You can purchase the Sizzling Sausage Grill here for under $80. To receive the grill in time for the holidays, be sure to place your order by December 11 and get FREE shipping with promo code “sizzle.” Promo code good until Dec. 11 for orders placed on SizzlingSausageGrill.com. So, buy your grill and then get to making these DELICIOUS brats! With our Nebraska roots, we love some beer brats around here! The process can take a while though! 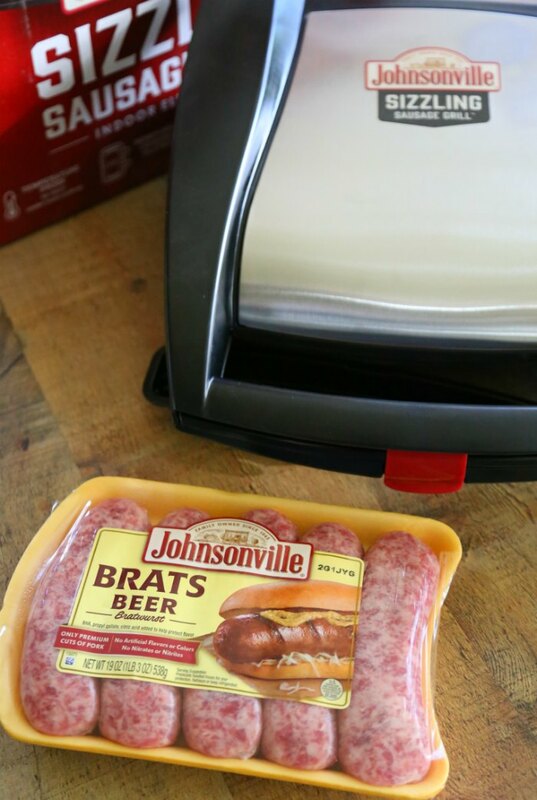 So instead of dealing with that process, I picked up some Johnsonville Beer Brats to try on our new Sizzling Sausage Grill! It was SOOOO easy! While the brats cooked right on the grill in the kitchen, I whipped up some delicious beer cheese sauce. In just 15 minutes, we had delicious food ready to go – which was perfect for some football watching this past weekend! 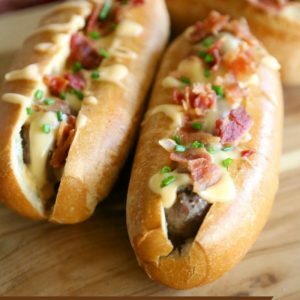 These bacon beer cheese brats are sure to be a hit at any party! *optional - diced chives for garnish. 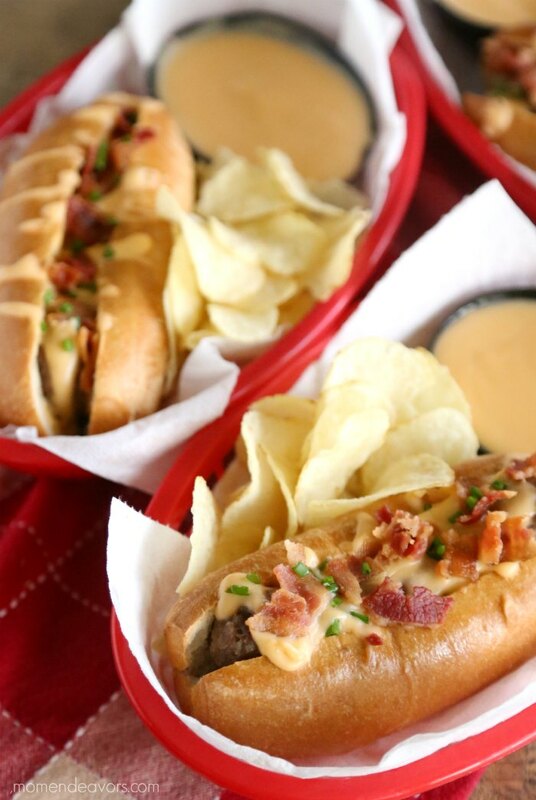 Cook bacon and prepare beer cheese sauce while the brats cook. Pour beer into a pot over medium-high heat. Once the beer just starts to boil/steam, reduce heat to medium-low. Add freshly shredded cheese slowly to the pan, stirring to avoid scalding the cheese. Then add cream cheese. Continue stirring until completely melted. Whisk in spices and Worcestershire sauce. Remove from heat. Once brats are done, place brats in buns. Top with beer cheese, bacon crumbles, and chives! * Sauce will thicken as it cools. But if you'd like a thicker sauce that works great for dipping as well, you can mix a slurry of 1 TBSP corn starch with some cold water. Then, add that in to the beer as you heat it and mix in the cheeses! Yum!!! These were SO good! I can’t wait to make another batch! I’m thinking they’d be the perfect New Year’s Day party food while watching football! Mmmmm! 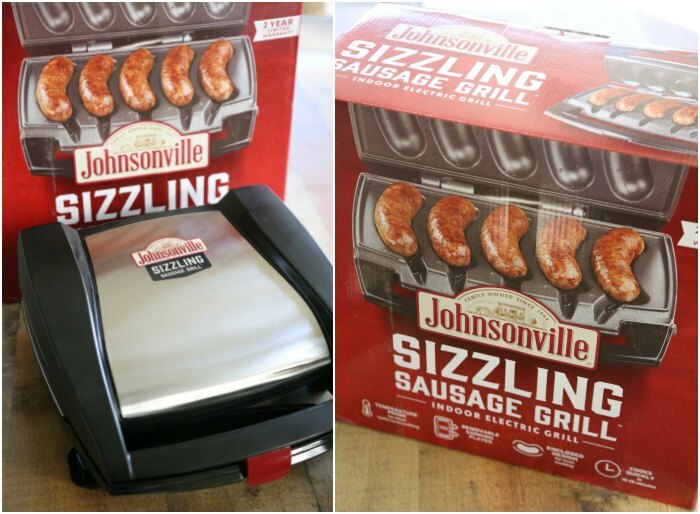 And with the Johnsonville Sizzling Sausage Grill, making brats couldn’t be easier! So, get your grill, grab your ingredients, and enjoy a bite of deliciousness! What is YOUR favorite way to eat brats?